Shipping KPI’s – shipping performance index, meta data , flawless port state controls, officer experience points – a trawl through the KPI website leads you to all these somewhat confusing and mind boggling statements. But what are they and perhaps, more importantly, what are they doing for the shipping industry? The Shipping KPI project is a joint initiative to enable the most significant effort of self regulation in shipping since the introduction of the ISMA Code. To help us understand all these terms a bit better, we were delighted to welcome Markus Schmitz, Managing Director of SOFTImpact Ltd.
For several years SoftImpact was involved in the KPI project of Intermanager and was then selected by InterManager to implement the system for gathering and benchmarking the KPI data of participating companies, the so called ‘InterManager KPI Environment’. 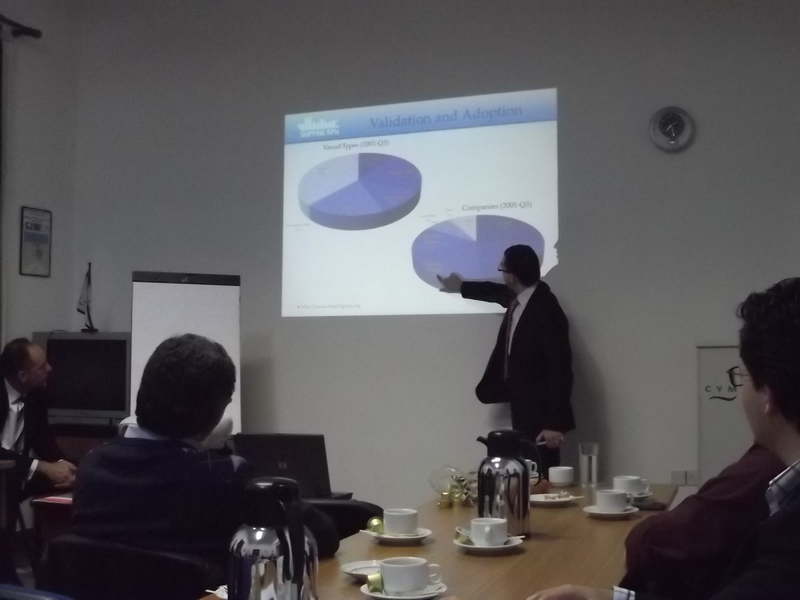 Markus gave us a very interesting explanation of the KPI system and showed us both ‘good’ and ‘bad’ KPIs. He explained that a good KPI must be observable and quantifiable, a real valid indicator of performance, robust against manipulation, sensitive to change, transparent and easy to understand and be comparable. He then explained the process of ‘aggregation’ by which he compared the KPI’s of two vessels and asked the audience to say which vessel was better according to their KPI performance. This was, of course, very difficult and raised questions about how each performance indicator was considered and weighted. Markus then explained the process of aggregation of performance indicators, how these are fed to Key Performance Indicators and finally to Shipping Performance Indicators. The process apparantly smooths out these anomalies, which are created during data collection. There are 7 shipping performance indicators covering everything from the environment to operations and navigation and it against these indicators that Ship Owners and Managers can start the benchmarking process in their ‘peer’ group. Markus then went on to show us the web based benchmarking system where Owners could potentially benchmark their ships against data from 656 other ships over almost 2 years of data. In concluding, Markus explained that recent developments included creation of ‘cluster’ groups in parts of the world who get together to discuss KPI issues and clarify any misunderstandings, the establishment of a KPI expert group, the development of interfaces between KPI and other software systems and, last but not least, the plan for the NI to author a book on KPIs.